Analysts and investors tend to spend very little time on Goodwill when looking at financial statements. Like most of the balance sheet, it gets glossed over as people rush to the income statement to find revenue and EPS, the headline numbers that supposedly “drive” stock performance. In reality, Goodwill is an important number to keep an eye on. Since it reflects the money paid for acquisitions above the market value of the acquired company, it can signal overpayment, reckless spending, and the potential for damaging write-downs in the near future. We’ve warned in the past of how write-downs destroy shareholder value. Goodwill is an especially important number to look at these days, as big acquisitions are happening at a nearly unprecedented pace. The total dollar amount of global mergers and acquisitions hit $3.5 trillion in 2014, up 47% from the year before. There were 95 deals valued at $5 billion or more. That’s a lot of Goodwill hitting a lot of balance sheets. M&A activity in 2015 has been even stronger. Academic research has consistently shown that large mergers and acquisitions tend to be value destroying for the acquiring shareholders. One study by KPMG found that only 17% of deals added value, 30% had no effect, and 53% actually destroyed value. Other researchers have come up with different numbers, but the vast majority agrees that more than half of mergers fail to create value. This reality appears to be disconnected from market perception of M&A. The evidence is clear that mergers and acquisitions are, at best, a highly risky and suboptimal way to create shareholder value, yet businesses continue to carry them out at a rapidly increasing rate. There are two primary drivers of this disconnect. For one, mergers and acquisitions can result in hefty payouts for the executives and insiders at the heart of the decision making process. Look at the massive sums of money executives and investment bankers stand to make from the upcoming Charter-Time Warner Cable merger. With such lucrative potential rewards, these insiders have a vested interest in propagating the myth that acquisitions are good for shareholders. This is accomplished through the outsized focus on accounting earnings per share in equity analysis. Investors buy into these deals on the premise that they will increase earnings, ignoring the fact that earnings accretion is a mirage. Accounting earnings don’t create value, economic earnings do. Sources: New Constructs, LLC and company filings. Excludes outlier Lorillard, which has negative invested capital. 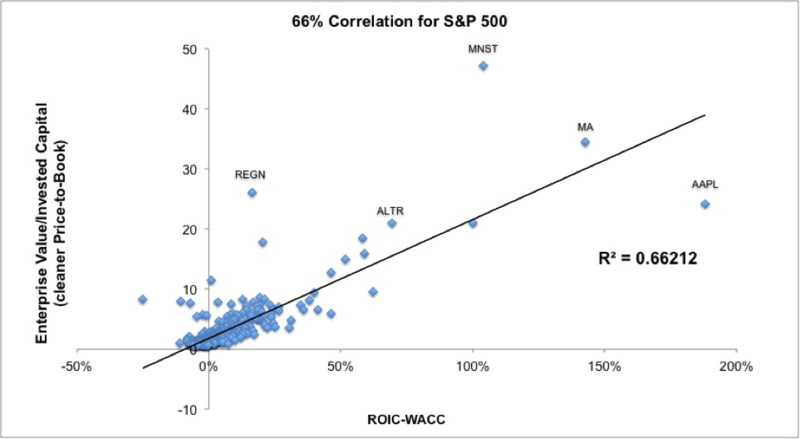 As shown in Figure 2, economic earnings, which measure the difference between return on invested capital (ROIC) and weighted average cost of capital (WACC) explain most of the difference in valuations for companies in the S&P 500. Another reason acquisitions continue to occur at such a high rate is the “valence effect”, the psychological tendency to overestimate the probability of positive outcomes and underestimate the probability of negative ones. Executives, analysts, and investors all fall prey to the idea that this specific acquisition is more likely to succeed, even though the majority of past ones have failed. Tracking Goodwill and write-downs allows us to see the valence effect in action. Goodwill represents the estimated value of an acquisition on top of the tangible assets. Write-downs occur when it is discovered that the true value is lower than the estimated value. 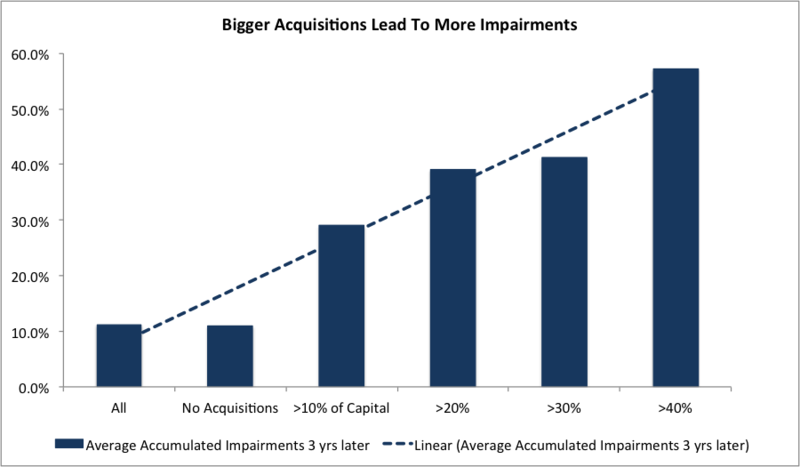 Figure 3 shows that large write-downs (also known as impairments) are directly correlated with big acquisitions that result in Goodwill. The data is clear. Acquiring companies consistently overstate the value of deals and end up having to undergo costly write-downs in the future when those deals don’t work out as expected. Of course, Goodwill and impairments aren’t of direct concern to investors. Ultimately, everyone cares about returns in the market. We’ve already shown that economic earnings drive returns and overpriced acquisitions hurt economic earnings. Additionally, the data shows a correlation between large impairments and market crashes, as seen in Figure 4. 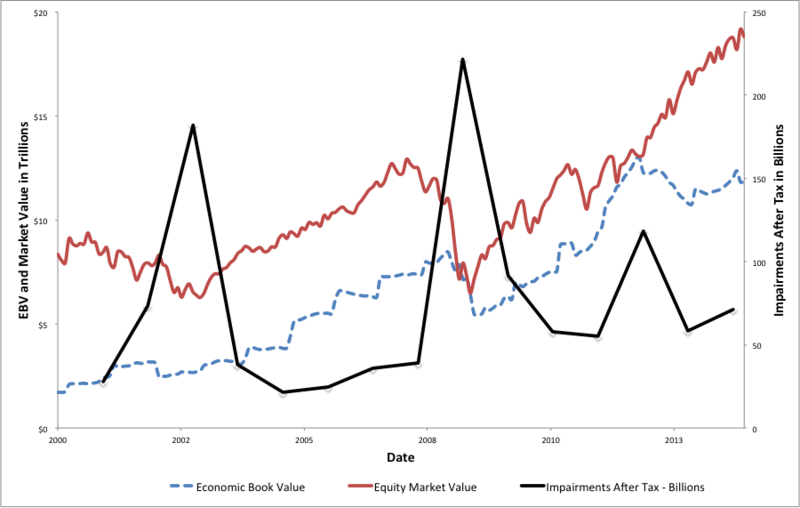 Big acquisitions artificially inflate book value and accounting earnings, leading to a gap between market valuations and economic book value. A bullish market can prop up this artificial value, but when market sentiment turns bearish, we tend to see that Goodwill wiped off the books in a dramatic manner. Overpriced acquisitions that create excessive Goodwill don’t just create risks during a market crash; they can lead to long-term underperformance. Take consumer goods giant Procter & Gamble (PG) as an example. On October 1, 2005, PG completed the acquisition of Gillette for over $50 billion, $35 billion of which was recorded as Goodwill. Overall, its Goodwill as a percentage of total invested capital spiked to 48%. PG’s underperformance since that date is striking. Its 30% return is less than half of the S&P 500’s 70% return. Major competitors Unilever (UL) and Colgate Palmolive (CL) have gained 83% and 150% respectively, while the entire consumer staples sector is up 110%. PG has underperformed its peers both during the market crash of ’08 and the ensuing bull market. Digging into the numbers, we see that the acquisition was accretive to PG’s EPS but hurt economic earnings. PG’s ROIC dropped from 16% in fiscal year 2005 (which ended in June of that year) to 11% the following year, and has hovered around 10% ever since. While PG has grown EPS by 69% since the acquisition, its economic earnings per share have declined by 3%. Like any metric, Goodwill should not be analyzed in isolation. An acquisition of a high ROIC business might create a significant amount of goodwill due to the low level of reported assets but still improve economic earnings. A thorough analysis of any specific company or acquisition requires an analysis of numerous factors. That being said, even an acquisition of a good company can be highly risky if done at the wrong price. Take, for example, Intel’s (INTC) recently announced $16.7 billion acquisition of Altera (ALTR). We’ve been bullish on INTC for some time and continue to rate it as Very Attractive. While we’re more mixed on ALTR, we do love its 78% ROIC. Additionally, the deal makes some strategic sense, as ALTR’s field-programmable gate display (FPGA) technology could help shore up INTC’s datacenter business while expanding its reach in connected devices and the Internet of Things (IoT). The high price, however, should raise some major concerns for investors. After subtracting net cash, the deal is worth roughly $14 billion. Most of the value will be recorded as Goodwill, which will likely increase INTC’s Goodwill as a percentage of Invested Capital from ~15% to above 25%. Even worse, ALTR’s TTM after-tax operating profit (NOPAT) of $470 million gives the deal an ROIC of just 3.4%, well below INTC’s WACC of 7.3%. Our bullishness on INTC has been due in part to its impressive 20% ROIC, so it’s disappointing to see it commit so much capital at such a low rate of return. The high price means that ALTR and INTC must have enormous synergies in order to create value for shareholders and the odds of value-destroying write-downs in the future are high. Here’s a useful model for how to measure the implied synergies and incremental ROIC of an acquisition. Goodwill doesn’t make it into the headlines very often, but it’s a number that astute investors should keep an eye on. For both individual companies and the broader market, high levels of acquisition activity and Goodwill can be a sign of future impairments and underperformance. Figure 5 shows 10 stocks that we believe to be at a large risk for significant asset write-downs in the near future. These companies have all completed major acquisitions in the past two years, earn our Dangerous-or-worse rating, and have extremely high levels of Goodwill as a percent of Invested Capital. Vacation rental website HomeAway (AWAY) tops the list. AWAY currently has $471 million in Goodwill on its balance sheet and just $526 million in invested capital. The majority of its non-cash assets could be written off the books at any time. AWAY has a history of overpaying for acquisitions, most recently with its $197 million deal for Australian rental website Stayz in 2013. $178 million of the purchase price was attributed to Goodwill. As of yet, none of that Goodwill, or the Goodwill for any of AWAY’s acquisitions, has been written down. We can see that the Stayz acquisition has already hurt shareholders, as AWAY’s ROIC fell from 7% in 2013 to 4.8% in 2014. Moreover, the stock itself has dropped 15% since the completion of the acquisition. Given the high price of the acquisition and the poor performance of the company since, it would not be surprising to see AWAY forced to record a significant write-down in the near future.